A storefront in Kowloon near the Science Museum. Unfortunately Trendyland was closed when we happened by, so I don't know what exciting new brands etc are available here. Judging by their sign I'm thinking they are actually a decade (if not more) behind the latest hot trends, so no Lady Gaga or Wii consoles. But great deals on acid-washed jeans, Miami Vice pastel jackets, and Hootie and the Blowfish CDs - all at trendy prices of course. 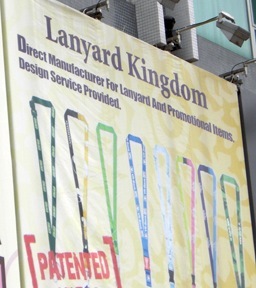 But beware, the lanyard kingdom is patented, so any attempt to start your own neck-accessory empire will meet with fierce resistance from Lanyo IX's crack legal team. I just checked the internets, and found this helpful blurb: Rather than using the well-established ‘Timeless Love’ tagline in the 90s, the theme has been remodeled to ‘Time is Love’. 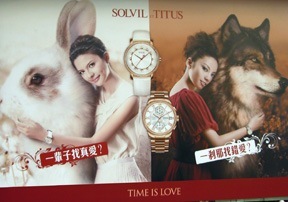 The campaign has kicked off with... ads questioning the idea of love... statistical results from the Hong Kong population are tagged under sections detailing topics such as the amount of money each gender spends on the other, the percentage of people believing in eternal love, or the amount of time each gender spends in preparation for a date. People are also invited to access a designated micro-site and Facebook group to voice their opinions on love, with the best most celebrated comment destined to win a five-star spa treatment and Solvil et Titus products." A cafe in Causeway Bay, which I was unable to find an entrance for, though I confess I didn't try especially hard. It sure looks dreamy - note the fans and outdoor speakers as well as a Parisian street lamp to add a touch of Champ Elysees. 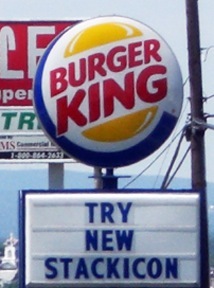 This is a sign from the local Burger King in Pennsylvania. I was initially intrigued by the term 'stackicon' and assumed it was some transformers tie-in; much to my consternation I found that I was correct. 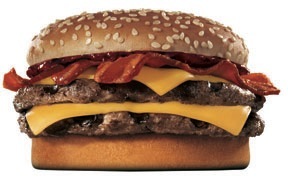 By the way our friends at the Gettysburg 'BK Lounge' (as we lovingly referred to it in high school) didn't bother to check the spelling, but it seems 'Stackticon' is a play on 'stackers', a BK sandwich you can stack - how clever. Yow. I should mention that the dollar bills float independently around the site for no reason. 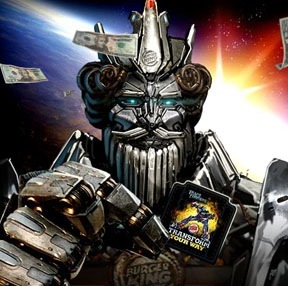 You can also roll over the king and get his 'transformer power ratings', one of which is for 'creepiness'. Love the hair. 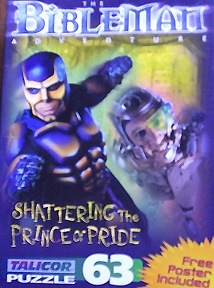 This is a puzzle from my parents house, that someone gave to my older brother at a toy fair. I guess 'hypocritically self-righteous man' and 'biblical quotes taken out of context to support my narrow religious beliefs man' were already taken. Not sure what his powers are exactly: quoting obscure bible passages to confound his liberal enemies? "...and Josiah begat his son Jebediah, and yea they did lay down with Yellenite whores and know them. Then fourscore years later did their progeny rise up and punish those same Yellenites for their sinful combining of wool and cotton..". So obviously, postal union organizers of the Tri-Cities area, you must repent your liberal ways or face the wrath of Yahweh!" (the same passage from Leviticus that evangelicals always quote to justify gay people being damned etc. also recommends death to anyone wearing wool and cotton together, so I guess all those righteous Southern senators in pristine wool suits and spotless cotton shirts are damned as well... but I digress). 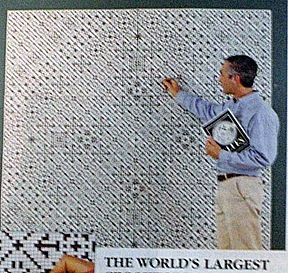 This is an older ad for a mobile service(?) here in HK. I love the T-Rex as faithful pooch motif, with his golden retriever coloring and lovingly personalized collar. I wonder what Sam plays fetch with; a water buffalo leg? An oar? 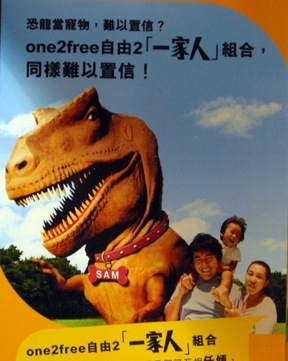 Anyway this ad left me wondering how the happy family below deals with Sam when he gets too hungry or grouchy; T-Rexes are notoriously difficult pets, though not as bad as rottweilers. Sam gets pretty frustrated when ordered to 'shake' - it reminds him of his near-useless front legs, and makes him feel frustrated and inadequate. And as everyone knows, 'a frustrated T-Rex is a dangerous T-Rex'. I wonder how this weekend's jaunt to the park turns out - "Sam Sit! Stay! I mean it buster! Honey make a break for the car while I distract him with the buffalo leg! Stay Sam stay!" Another Tokyo arcade game from last xmas. You can't read the name unfortunately, but this game is called "Prisoner of Love" in the upper right-hand corner. 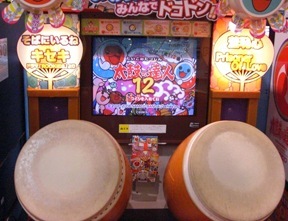 Maybe its from an old Japanese poem - my tears fall like drumbeats upon my video parlor taiko drums... maybe not. Anyway I couldn't get this thing to work, and no one came up to play, so I don't know how you 'free your love', though I assume it's like dance dance revolution etc, and that you have to match the games cadence with your own drums. A good workout at least, and far safer than the Beeterro ride mentioned earlier. Unless the prisoner of love is Godzilla, and playing them just right unleashes him (again) on Tokyo. Never Osaka, always Tokyo. I Corrupt All Cops! All of Them! Me! Another forgotten laptop image, this one a bus-side ad for "I Corrupt All Cops" a Hong Kong original movie. I just thought the name was hilarious to be honest, though I'm glad I looked it up - the title is a 'clever' play on the abbreviation “ICAC”, the Independent Commission Against Corruption, an infamous anti-corruption force set up in the '70s to clean up HK's notoriously corrupt police force. Hey Kids - Who's First on Beeterro? 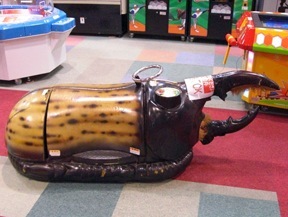 Anyway this is a hercules beetle ride in a Tokyo arcade. No sign of an accompanying 'dung beetle' ride, complete with 6-foot dung ball that you roll in front of you and defend like its made of gold... oh well, probably so much the better. Much to my surprise it sat strangely idle; one would think that kids would line up around the block (and forego those newfangled 'video' games nearby) for a chance to mount 'hercu-beetle' and pretend they are slowly shuffling through the leaf litter, feasting on detritus just like a real beetle. A restaurant/bar/refueling station near the famed Monterey Aquarium (which I highly recommend by the way). Unfortunately we were already committed to Mexican food, so I was unable to sample the (no doubt cleverly named) wares at Sly's. Also I did want to include a few American signs from our visit here, just to remind my loyal reader(s) that Hong Kong has serious competition for surreal names and preposterous advertising. "OK... OK... focus! Got to go easy on the ZIMA bro, you only have two 4-packs left... I think I need some more Chex Party Mix to coat my tummy. 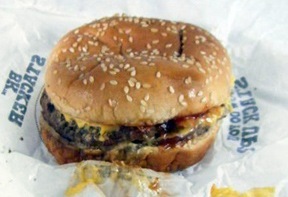 OK where was I... Aha! Just a quick glance in the convenient 3,286-page guide... what's a 8 letter word for 'very, very sad'? 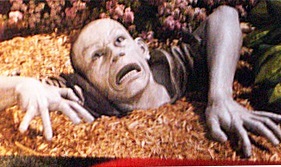 Hmmm..."
Another garden accessory from our friends at Toscano in the SkyMall catalog. Nothing compliments a garden yeti quite like a lifesize zombie erupting from your azaleas. His official name is the "Zombie of Montclaire Moors(? )", or Monty for short. From the infamous SkyMall catalog on our flight from San Francisco to DC. Now you too can have your every own garden yeti, over 2 feet of mysterious (until now!) primate, guaranteed to spark lively conversation and terrify neighborhood children. Apparently garden gnomes are no longer a viable kitsch option, thanks to travelocity's annoying ad campaign, which they stole by the way. (In the interest of full disclosure I must confess to owning an 'alien yard gnome' in our backyard in DC, appropriately named 'Roswell'). Note that he's posed like the famous film still of Bigfoot - and yes I've watched enough bad TV - think 'Monsterquest on the History Channel - to recognize it instantly. 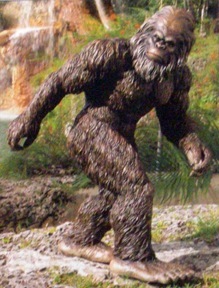 Several noteworthy things about the garden yeti - the catalog calls him 'Bigfoot the Garden Yeti': an incredibly uninspired and confusing nickname, like 'Puma the Tiger'; also everyone knows that yeti are found in the Himalayas, not in suburban US gardens where most bigfoot sightings occur... Why not call him 'Yeti the Garden Bigfoot'? That way he could have an exotic name to bandy about when meeting other garden Bigfeet(?) "yeah my parents went to Nepal and named me after my third cousin - thought it'd be cool. My brother Sasquatch was born in Vancouver...". This is from the eminently forgettable (and preposterously overpriced) Portola hotel in Monterey CA; the only hotel I've ever stayed at that charged a US DOLLAR A MINUTE for internet access - yep 60 bucks an hour. No doubt cheaper - and more reiiable - in Birkina Faso. The package below is the in-room coffee selection for the circa 1985 coffeemaker. 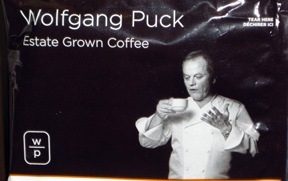 It seems the intrepid entrepeneur Wolfgang Puck is at it again with his hand-crafted 'signature coffee' blends. Only the highest quality beans are selected in their millions by the Maestro himself - to be freeze dried and bagged by the ton for tourist trap hotels like the lovely Portola. Hard working man our Wolfgang, first with Spago(?) or whatever his restaurant is called, then the gourmet microwave pizzas (each one meticulously hand-crafted by the Maestro himself- then shipped to Costcos and Walmarts across the country). Anyway what caught my eye was Wolfgang's expression on the packaging - I assume he's supposed to look dutifully impressed with his creation, but he seems more like "Vas is dis? You call zis f*cking coffee?!" Having tried it myself I have to say I'm more in the latter camp.